I have been waiting for just the right set of ingredients to become available in order to put a large batch of local baby vegetables under a pickle. The stars have finally aligned and in a few short weeks we will have a batch of beautiful pickled veggies. As you can see I went for a varied assortment of vegetables. I was lucky to come upon some absolutely heavenly small yellow cucumbers that had not developed much of a skin or toothsome seeds. They are just perfect. I also found wonderfully sweet Mars Onions. They are rather small, red, mild and sweet. 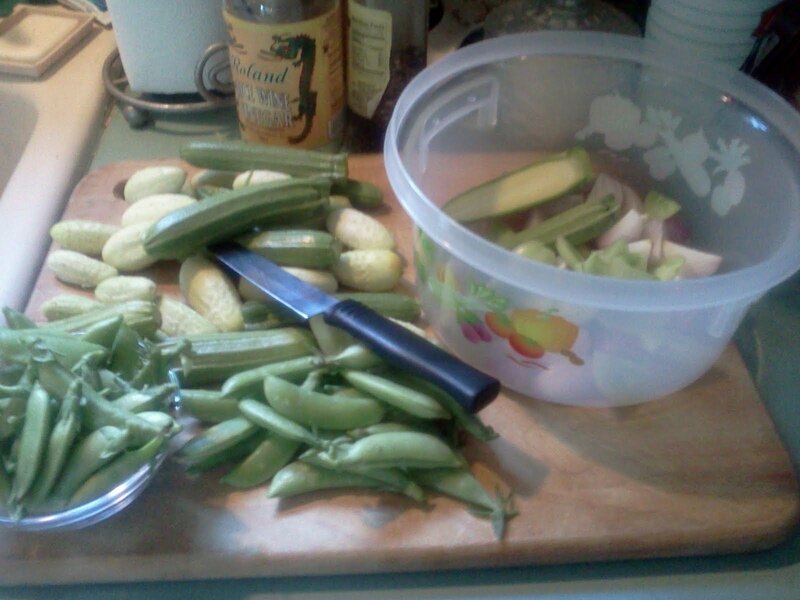 There are also some finger length green zucchini, carrots, whole local garlic cloves, and lastly sugar snap peas. I've never pickled peas so we will have to cross our fingers on how they come out. I acquired a standard pickling spice blend from Spicehound and added that to my standard pickle ratios along with a handful of thyme, sage and rosemary. I put a layer of lemons over the whole mess for a little added twang and put a "do not disturb" label on the bowl and set it away to magically transform. My standard pickle ratios are very simple; equal parts sugar, water, and vinegar. I usually prefer rice wine vinegar as it has a smoother tartness in my opinion compared to wine or cider vinegars. In this specific batch I used three parts rice wine to one part cider vinegar because I planned on adding a full assortment of other strong flavored herbs and wanted to assure a strong tang in the end product. 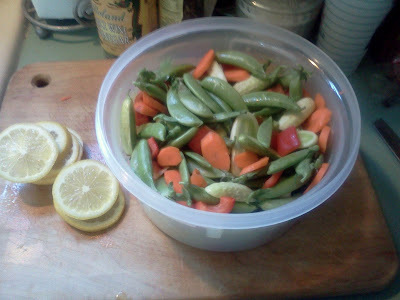 The amount of liquid is roughly the amount needed to cover the amount of vegetables. This may change with regard to the size of the vegetables and/or the container but what is really important is the ratio of sugar, vinegar and water. I start by heating the sugar, vinegar, garlic, and pickling spices over medium heat. Once the sugar dissolves remove from heat and add cold water to chill the liquid and set aside while preparing the vegetables. As long as the liquid is room temperature when added to the vegetables it will work fine, but steer away from adding hot pickling liquid over the vegetables as this will make for a very limp and soft end product. That's all, pack it up and let it sit for about two weeks. Feel free to stir it up every so often.